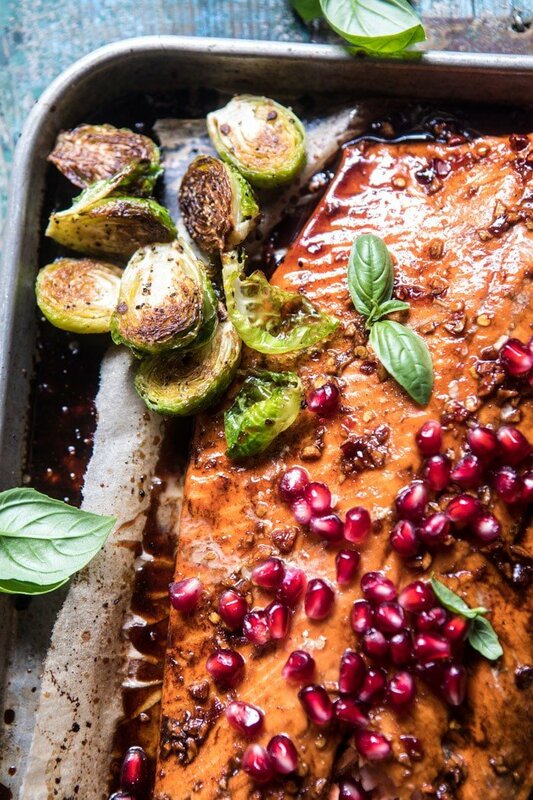 Pan Roasted Pomegranate Glazed Salmon. 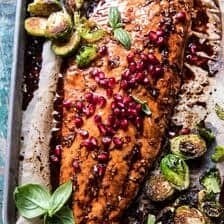 I could not be happier about the return of pomegranates, and I am celebrating them with this pan roasted pomegranate glazed salmon. Have you ever seen such a pretty piece of salmon? It’s the pomegranate arils, they get me every season, SO pretty! Today I am going to attempt to jump right into the recipe because one, I have so much to say about it, and two, I need to go respond to everyone’s kind comments from the last few days (THANK YOU!). This salmon is delicious and totally not your same old dull salmon dinner, which I don’t know about you guys, but it just makes me cringe even thinking about another plate of ordinary salmon and broccoli. I mean, right?!? 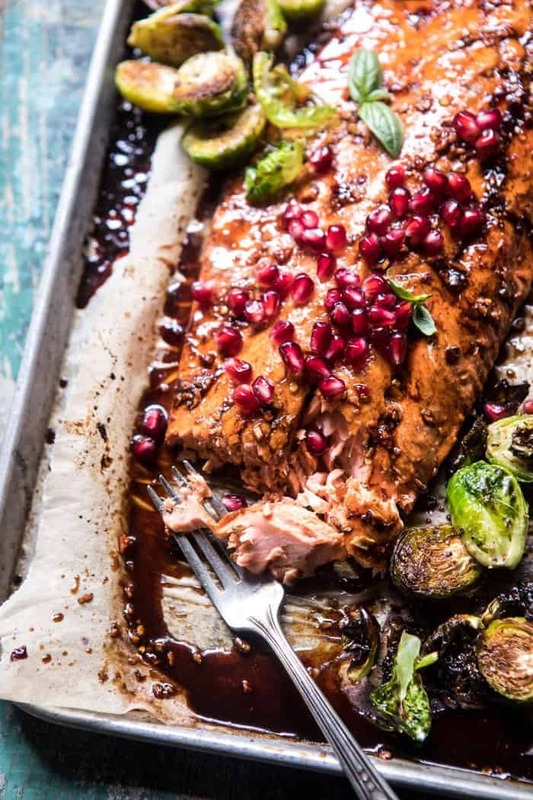 Trust me, there’s nothing boring about this sheet pan roasted salmon. It’s sweet, tangy, and all things semi-addictive…or about as addictive as salmon and veggies can be (let’s just be real, it’s not cheesy pasta…). Lately I’ve been so into letting my oven do all the work of cooking. I suppose that’s kind of odd, since we’re just coming off of summer, and summer is supposed to be all about no oven cooking. But because of where I live, and the very, very mild temperatures we have all summer long, I pretty much use my oven daily. Thankfully, the temperatures should be starting to cool off in most parts of the US soon, and that means back to roasting things. YAY! Here’s the deal, this salmon recipe could not be any more uncomplicated. It’s no secret around here that I like to have fun with my recipes. Thus I’m also totally unafraid to whip up a few complicated recipes every now and then. But many times simple is best, and that’s this salmon recipe, simple, but yummy! Anyway, on to the salmon. While the sprouts begin roasting, mix up a super quick, sweet and sticky pomegranate glaze. I used a mix of pomegranate molasses, sweet chili sauce, pomegranate juice, ginger, and garlic. Just a few ingredients, but still so full of flavor. After the brussels sprouts have roasted a bit, you’ll add the salmon and then spread the glaze over top. Roast for a bit longer and DONE. Do you see what I mean? So uncomplicated. Cool. Cool. My favorite way of serving up this salmon is with some steamed rice. It completes this Asian inspired meal. OH, and the glaze? Well, as mentioned it’s sweet and sticky, but honestly it’s one of my go-to glazes for so many Asian inspired recipes. It takes every recipe from good to addictingly good. And guys, that’s kind of it. Simple recipe, but don’t let that fool you, it’s just as delicious, if not more so, than any other more complicated salmon recipe. And lastly? Can we just talk cookbook things real fast? I know I have not stopped talking about the cookbook literally all week, but you guys are killing me with your kindness these last few days. The amount of comments, emails, and DM’s on Instagram have me in just utter shock. I am so thankful for you guys! The book is doing so well and it’s all because of each of YOU! Thank you! OKAY…enough gushing…off to go respond to all of you kind followers. It might take me a while, but I am going to try to read everyone’s comments and respond the best I can! Keep bugging me if I don’t respond to any questions. There has been a ton, so it’s a little hard to keep up and keep track! Good news for me is that at least I know what dinner is going to be. I am in need of something on the healthier side (made a lot of cheesy things and fried things this week…along with a little celebration cake! ), so this is the perfect recipe for tonight. Plus, I went crazy at the store and stocked up on all the brussels sprouts and pomegranates I could get my hands on…I am so weird. OKAY. Now I am done. Everyone will think that you've spent hours in the kitchen with this tasty meal! 2. On a large rimmed baking sheet, combine the brussels sprouts, olive oil, and a pinch each of salt and pepper. Toss well to evenly coat. Place in the oven and roast for 15 minutes. 3. Meanwhile, combine the pomegranate molasses, pomegranate juice, sweet chili sauce, ginger, garlic, and a pinch each of red pepper flakes and salt in a small bowl. 4. Remove the brussels sprouts from the oven. Add the salmon to the center of the pan. 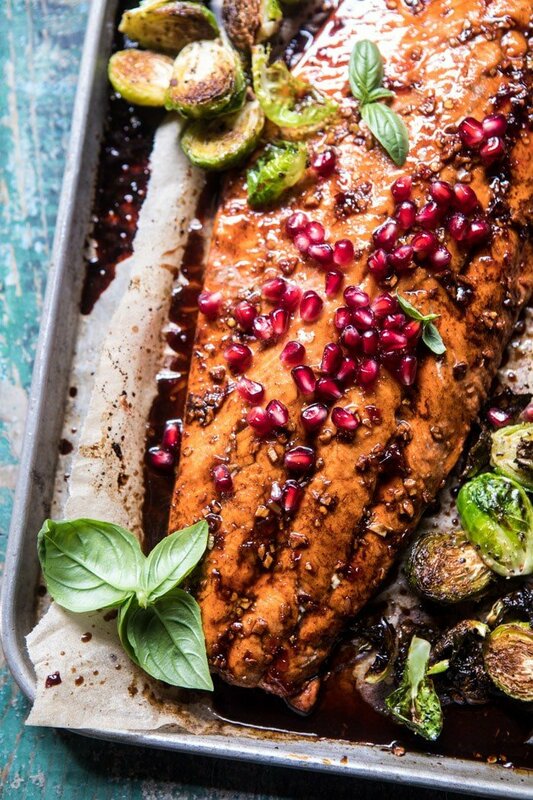 Spoon the pomegranate glaze over the salmon. Transfer to the oven and roast for 10-20 minutes or until the salmon has reached your desired doneness. 5. 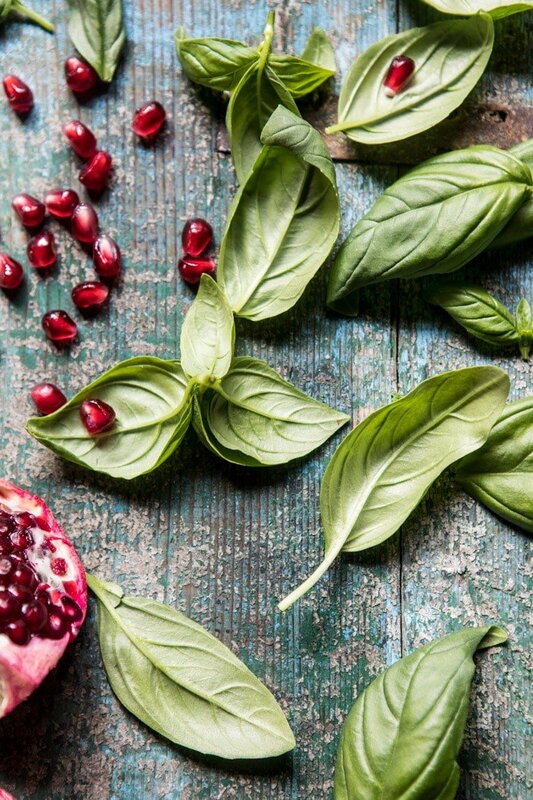 Top the salmon with pomegranate arils and fresh basil. Enjoy! Happy Thursday! Tomorrow…something sweet and fallish is coming! 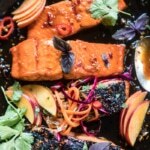 20 Minute Crispy Honey Ginger Salmon. I love love love salmon, this is a must try in my books! I hope you love it Maëva! I have a question on the pomegranate molasses. I have never come across it where I live so my question is whether you can substitute it for something else. Thank you. I too would like to know about where to get pomegranate molasses…and a substitute that would work. You mentioned potatoes in the directions but not the recipe list of ingredients. If so how many? My copy of your cookbook arrived two days ago…I’ve decided to stop putting sticky notes on the recipes to try because it is literally EVERY PAGE!!! So excited for you and so impressed with the book. 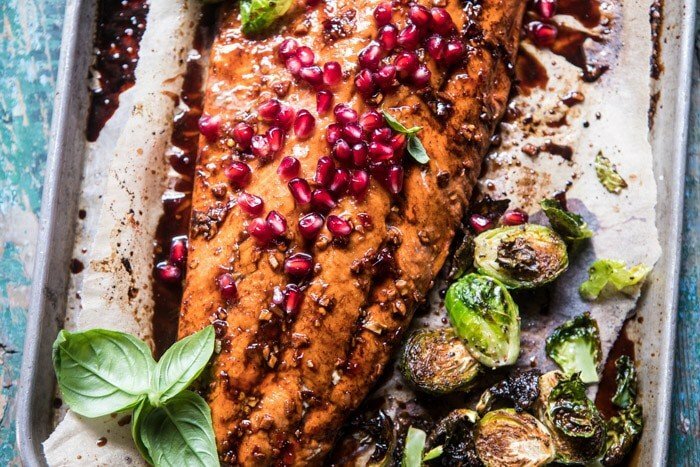 Definitely making this salmon and Brussels sprouts-looks so delicious. Quick question-do you grocery shop every day? I am amazed at the ingredients you use and wonder how you create your grocery lists. Kristen; I believe the word ‘potatoes’ is a typo and should read’brussel sprouts’. Pomegranate molasses can be purchased at most middle eastern stores. 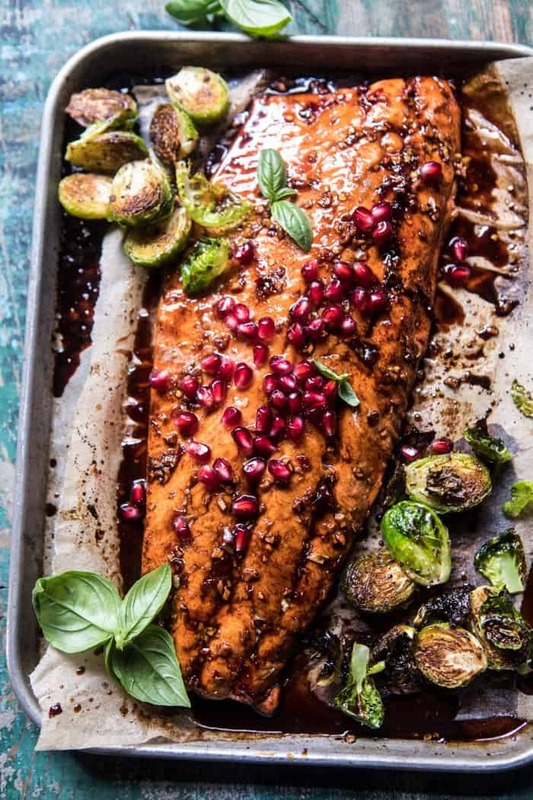 I am in love with this pomegranate salmon combo! SO trying this! Me too!! Hope you love it Amanda, thanks! Yum! 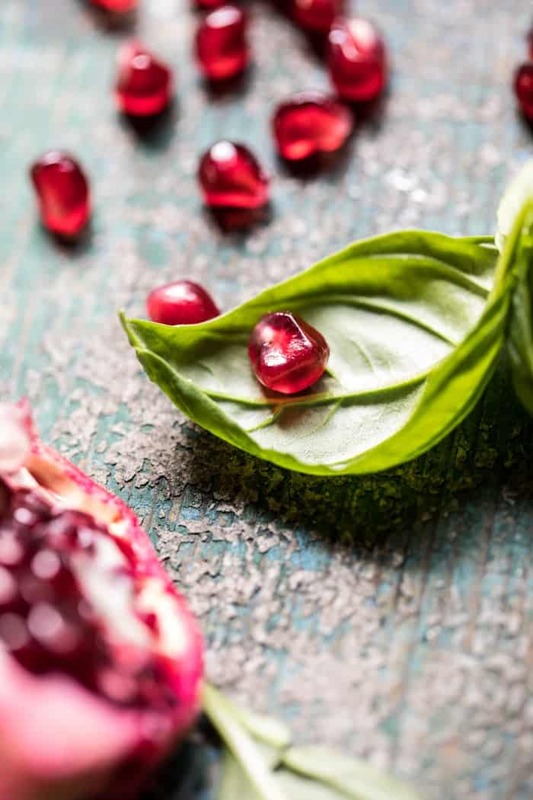 Those pomegranate seeds make it look so festive! This looks amazing. My fridge is FULL of poms… and figs, right now because I just can’t get enough. And this looks like the perfect use for poms! Oh my.. sounds like the dream fridge lol! Hope you love this, thanks Debs! Woohoo for the return of pomegranates! This salmon looks awesome Tieghan. Love that glaze! C’mon your recipes looks delicious. You site is already on my favourites. Stunning! And all those flavors – Oh. Em. Gee. Can’t wait to try this! Pics and food just so beautiful. I’m having guests over in a few days, and I’m thinking about making this salmon for dinner. What do you think will pair well with it? Some type of starch maybe? Or a salad? Thoughts? Thank you for your help. I’m loving the cookbook!!! 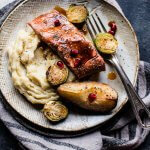 Love that recommendation, I love potatoes, especially cheese with potatoes 🙂 Do you think it would be a good idea to marinate the salmon in the pomegranate glaze? I was thinking of prepping most of the food the day before and popping it into the oven right before dinner. Hey Ella! I think marinating is a great idea, but I would not marinate more than 2 hours or so or you will draw too much moisture from the salmon. Hope that helps! Enjoy all the recipes and have a great dinner! This looks super delicious. 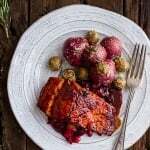 I love salmon and now i got new recipe to try. 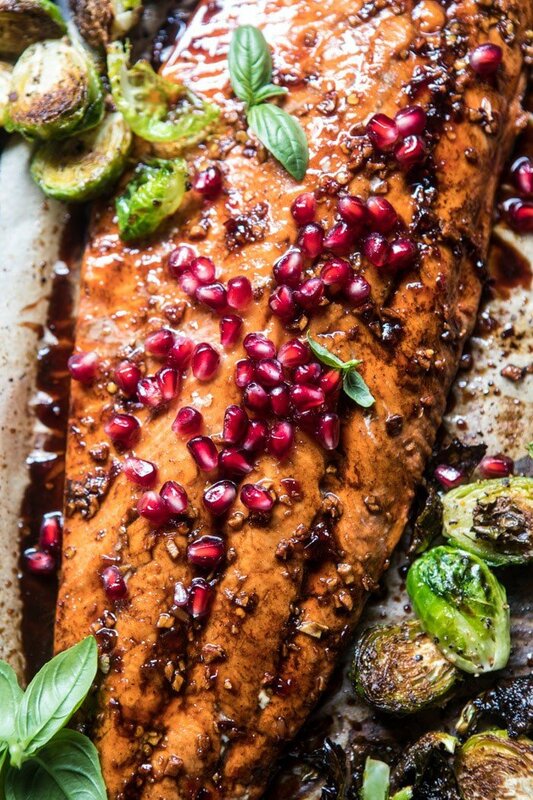 Can’t wait to try homemade Pan Roasted Pomegranate Glazed Salmon. I am thinking about cooking it for my guests like Ella as well. I will write back to you after my dinner event with guest reviews. I hope you and your guests love this salmon Season! Thank you! This looks amazing. We have a Pomegranate tree and lots of fruit this year. Do you have a recipe for the Pomegranate Molasses? Hi! I made this the other night and the salmon was delicious but the sauce in the roasting pan completely burnt. Did you ever have this issue? Hi! I have not had this issue, but my salmon might be smaller then the one you used. Was your large? Sorry for the trouble! Please let me know if you have any other questions. Thank you! Hi Eliza! The print button should be right under the last photo. Let me know if it still is not working for you! I am so glad you like my blog, this is so sweet! Thank you! Hi there! What do you use for the sweet chili sauce? And as for a substitute for molasses all together, would honey work? Thanks! Where can you find pomegranate molasses? Thank you! This looks amazing! I wonder if you or anyone out there has made this with another type of fish, since I’m not crazy about salmon but love any other kind. Thanks! 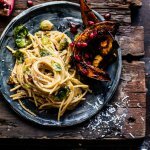 My friend introduced me to your blog about two months ago and I have made 8 of your recipes. This one was such a huge hit! Because I am always trying to find new ways to cook salmon! Thank you for this beautiful and delicious meal!!! Hi! I am so glad you loved this and have been enjoying the recipes on my blog! Thank you so much! Another wonderful salmon recipe! Thanks for sharing!